GM and Segway have teamed up to create a two-wheel vehicle called the P.U.M.A. 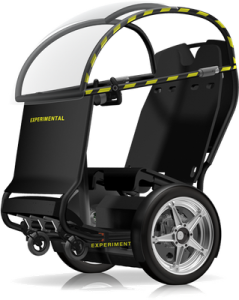 – or the Personal Urban Mobility and Accessibility vehicle. The Puma is a two-wheel, self-balancing 35-mile-per-hour urban pod with a maximum range of 35 miles on a fully charged set of its lithium-ion batteries. Acccording to Register Hardware, which has only seen pictures so far, each Puma is apparently driven by two small electric motors that are inside the wheels. The car will linked into to a live digital network giving details of nearby parking spaces, charge points or coffee shops, and allowing for vehicle-to-vehicle communications. Presumably, then a tweaked and enhanced urban-centric version of GM’s OnStar system. All controls are managed by a fly-by-wire system, while dashboard information will be displayed on connected devices such as the iPhone. The Puma holds potential for people who have mobility difficulties, or use a wheelchair. Potentially, these individuals could drive to work and otherwise navigate the city in these pod-like vehicles, which are faster, safer and more durable than using a wheelchair on city streets. “Imagine small, nimble electric vehicles that know where other moving objects are and avoid running into them. Now, connect those vehicles in an Internet-like web and you can greatly enhance the ability of people to move through cities, find places to park and connect to their social and business networks,” said Larry Burns, GM VP of R&D and Strategic Planning. GM and Segway will unveil the Puma prototype at the New York Motor Show later this week.